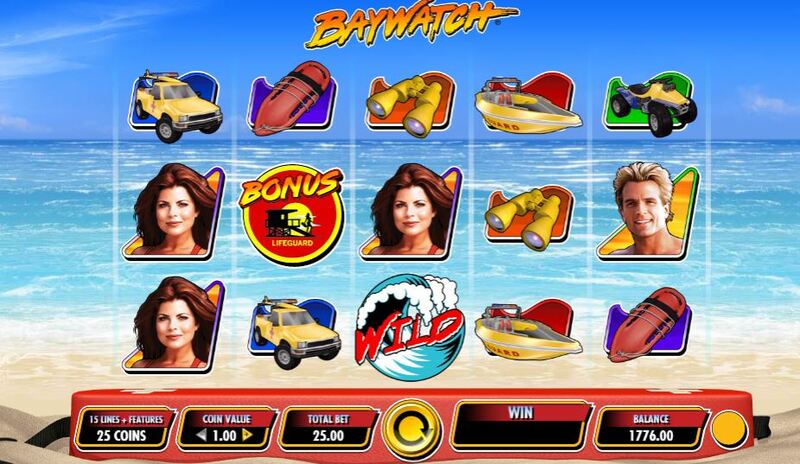 Baywatch slot is actually the second time we've seen this title, as Playtech have their own and far more polished version with 243 ways, movie scenes and sound bites to boot although based on the universally panned 2017 film. Here we have more basic graphics and icons with transparent reels spinning over a beach and sea animation with moving waves and surf sounds to complete the scene. You get strains of the Baywatch theme tune (oh, joy!) and naturally we see the silicone sister herself prominent on the reels along with David Hasselhof (minus the cheeseburger fortunately) and a couple of other cast characters. 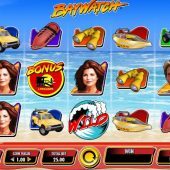 IGT seldom do film or TV slots although they did a decent Ghostbusters game, so will these picturesque lifeguards be able to save our bankroll from sinking? We begin our time on the beach with 15 paying lines for which you'd expect to pay 15 coins but no, we pay 25 because of a certain in-play feature we shall see shortly. The four characters are the best pays at 4x stake for a full 5-of-a-kind line, and they are Pamela and David. Gayle and Craig pay 3x, Boat or Jeep 1x and the Sand Buggy, Surfboard or Binoculars 0.8x for a full line. Surprisingly this TV series ran from 1989-99 and there were numerous spin-offs from it, but this doesn't seem to have spread to the reels with these low pays, although the characters can appear stacked 2-rows high too. Things do improve with the Teamwork feature, where randomly any male and female lifeguard can pair up and the symbols will change (if a win is can be produced) after a spin ends. This occurs when there are just two types on the grid in view, for example on a pay line you could have Pamela-Pamela-David-Pamela-David which wouldn't usually pay, but with Teamwork they would become a 5-of-a-kind win and not only that, they pay 10x bet for a full line too so are the best pay possible. This is cool, but the Wild waves are even better! You get single Wilds on reels 2, 3 and 4 which can randomly expand. If they do, then a wave will sweep from the left to the right and may wash the Wild reel onto the one to the right of it. If you have 2 in view and this wave does its stuff, you'll see 3 or 4 reels become Wild depending on whether the first Wild is on reel 2 or 3. You will see red and yellow lifeguard posts on the centre 3 reels. If all 3 appear at once, you get free games and are taken to a screen hereby you select one male and one female character. Each will give you 3+ spins and they become the characters on the reels for the free spins. You can't retrigger but the Wilds still appear and you get the Teamwork bonus on every spin guaranteed which means you can get the higher 10x bet pays for a full line.